South Africans called to honour Madiba's legacy - SABC News - Breaking news, special reports, world, business, sport coverage of all South African current events. Africa's news leader. 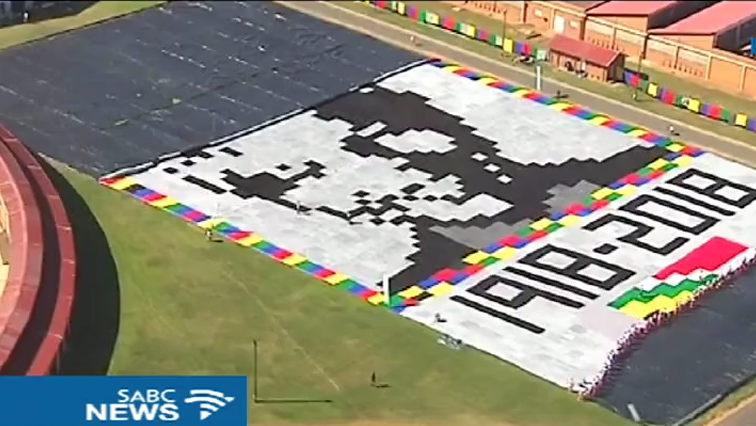 The Madiba blanket portrait was knitted together mostly by inmates. Machel was speaking at the launch of the Massive Mandela Masterpiece at Zonderwater Correctional Centre in Pretoria on Tuesday. It’s been called the largest portrait blanket in the world. It bears Madiba’s face in honour of his upcoming centenary birthday. “Each one of us has to choose his or her way of making a difference that we can make our country a safe country, make a country where everyone has food on their table, to make it a country where every sick person can be treated. We can! We are millions of South Africans with minds, hearts and hands to make a difference, this is the best way to living Madiba’s legacy,” says Machel. While appreciating the 27 Blankets’ efforts to honour Madiba, Machel says it was still a difficult time for the Mandela family due to the recent departure of Mama Winnie Madikizela-Mandela. The portrait is made up of over 4000 blankets knitted by inmates who are inspired by Madiba’s legacy. Madiba would have turned 100 years on July 18 this year and he remains celebrated as the father of the nation.